How much does it cost to travel to Reykjavik? How much money will you need in Reykjavik? kr27,429 ($228) is the average daily price for traveling in Reykjavik. The average price of food for one day is kr3,368 ($28). The average price of a hotel for a couple is kr31,156 ($258). Additional pricing is in the table below. These average travel prices have been collected from other travelers to help you plan your own travel budget. How much money do I need for Reykjavik? Reykjavik is the capital and largest city in the country of Iceland. The city is where the vast majority of the country's population resides and the urban area has about 200,000 residents. The city is sprawling, with a large area covered in suburbs. The the city center is quite compact, with many interesting and colorful houses. There are a lot of things that attract tourists to this city, including an interesting culture and history as well as plenty of shopping and dining opportunities. Reykjavik's climate is subpolar oceanic with unpredictable shifts in temperature and precipitation. It is not uncommon for a beautiful, sunny summer day to change into a rainy and cool afternoon or evening. Temperatures are relatively moderate throughout the year. January is the coldest month and you can expect some snow. Summer is the best time to visit. The temperatures are still quite cool with temperatures ranging from 10 to 15 degrees Celsius and sometimes going over 20 degrees Celsius. While visitors consider these temperatures cool, residents take full advantage of them, soaking up the sun and enjoying the outdoors while they have the opportunity. Reykjavik's old town is a pleasant area to walk around. The houses are unique and brightly colored, making for an interesting atmosphere. Make sure you allow yourself enough time to just wander. The city also has many parks. Popular ones include Tjornin, Austurvollur, Klambratun and Reykjavik Botanical Gardens, among others. Popular museums include the National Gallery of Iceland, the Reykjavik Art Museum, the National Museum of Iceland and the City Museum. One of the most famous places to visit in Iceland is the Blue Lagoon. It is a Geothermal Spa that is located between the city of Reykjavik and Keflavik Airport. It's about a 45-minute drive from the city's downtown, and once you're there, you'll find plenty of parking. In addition to this famous destination, there are other hotsprings in Iceland that are worth visiting and less crowded. Neighborhoods of interest in Reykjavik include the City Center (also referred to as the Old Town), Laugavegur, Laugadalur, and the 'Burbs. The City Center is where you'll find most of the tourist sights. It's a great area to walk around. Laugavegur is the shopping area in town. There are many high end boutiques as well as coffee shops and cafes. Laugadalur is to the north of the center and runs along the coast. It is a residential area with hot springs. The 'Burbs are predominantly residential with little of interest for tourists. There are many activities that you can enjoy in town. There is a great music scene with plenty of concerts year around. There are also two main theaters where you can see impressive shows. Festivals in the city include Culture Night in August, Gay Pride, also in August, National Day in June, Iceland Airwaves in October, the Reykjavik International Film Festival in September and the Reykjavik Arts Festival in May. Eating out in Iceland can be expensive. There are some decent budget options around town, but the quality of the food can vary. International restaurants that sell Thai or Chinese food may be a good option. In particular, there are many different Thai restaurants as they form a sizable minority in the country. There are also plenty of fast food restaurants around town that are similar to what you'd find in Europe or the United States. You'll find recognizable chains such as KFC or McDonalds, but you'll also find some Icelandic chains such as Nonnabit or Ali Baba, which sells kebabs. Many places are open all night over the weekends. Hot dog stands are also everywhere and very affordable. If you're on a particularly tight budget, then you can grab some ready made food at a 10-11. This is a convenience store chain that has sandwiches, wraps, and tacos. Even more affordable is the low cost supermarket chain of Bonus. Fish shops are also a great option if you're prepared to cook it yourself. Most visitors enjoy walking around the city center in Reykjavik. Most of the attractions are within close proximity of each other, and many of the hotels are in the same area. There are excellent sidewalks around town and there is also a footpath that circles the entire city. It passes by an outdoor swimming pool, a sandy beach, a golf course, and a salmon river. You can pick it up almost anywhere that the city meets the sea. There is a public bus system that is efficient and reliable. You'll likely make use of the system if your hotel is outside of the city center. Day passes are available if you plan to use the system frequently. Also consider picking up a "Welcome card" at the tourist information center by Ingolfstorg. This will give you free access to the buses as well as several museums. The main bus terminals are Hlemmur and Lækjartorg. There you can pick up buses that will take you to any part of the city. Most residents of the city prefer to drive around town, but as a tourist, a vehicle is not necessary. If you hope to travel outside of the city, such as to the South Coast of Iceland, it is recommended that you have a vehicle. There is a decent amount of parking available around town and you'll find large parking lots by the harbour and in front of the flea market. Getting to Iceland is quite easy, as a number of airlines fly through Reykjavik, including Iceland Air and WOW Airlines. (Check out this review of WOW Airlines here for more information.) Most major U.S. and European airlines also have stopovers here. Iceland makes for a great combination with Ireland for a one-week itinerary to Europe. Traveling independently and looking for a hostel in Iceland? 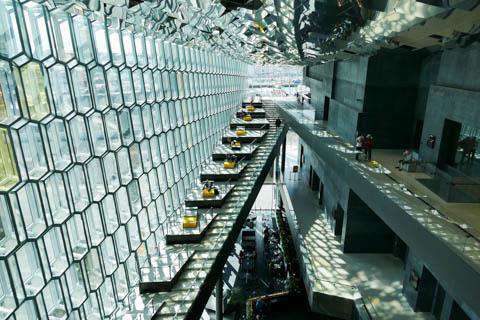 Are you organizing group travel and need a place to stay in Reykjavik?